WhatsApp's developers suffer from a bit of a delay when it comes to updating their changelogs on the Play Store. Yesterday, they pushed version 2.16.262 (followed by 2.16.263) to the beta channel on the Play Store, but the changelog mentioned features we've seen in v2.16.230 like forwarding to multiple contacts and frequent chats, but didn't say anything about the new feature that was really newly implemented in 2.16.262: image drawing, nor did it say anything about the big emojis we've been seeing since 2.16.256. But before we get ahead of ourselves, let's start with the official changelog. From the changelog, we've already talked about forwarding or sharing with multiple contacts as well as frequent chats when they rolled out in 2.16.230. We're not sure when exactly the other two were added, they might have been there since 230 too, or they may be more recent. The important part though is that they're now there in 2.16.262 (and 263). For the front-facing flash, the screen will light up white when taking a selfie, acting thus as a make-shift flash to better illuminate your face in dark environments. And when you're holding the record button to capture a video, you just need to slide your finger up and down to zoom in and out. This may sound familiar to all of you Snapchat users, but everyone is now copying this gesture, including Instagram and WhatsApp. Keep in mind though that both features only work in WhatsApp's camera, ie you will need to tap the camera icon in the text entry box at the bottom of the chat and not the attachment icon from the top and then the camera. 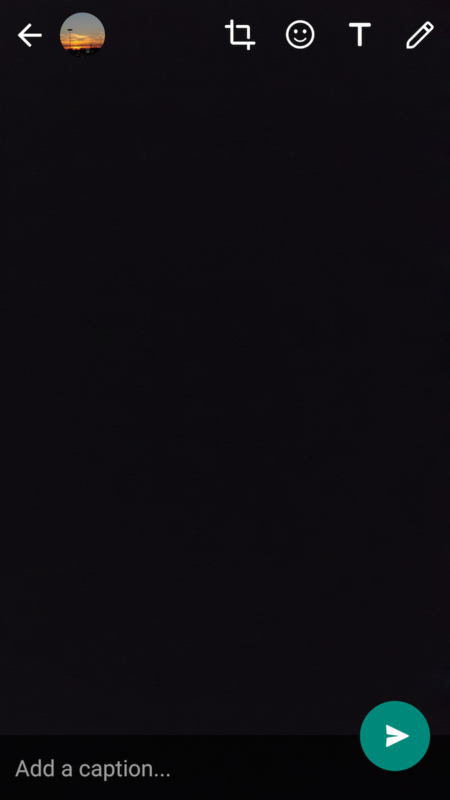 I know that's confusing, but the latter launches your phone's default camera app while the former is the one that goes into the WhatsApp cam interface. 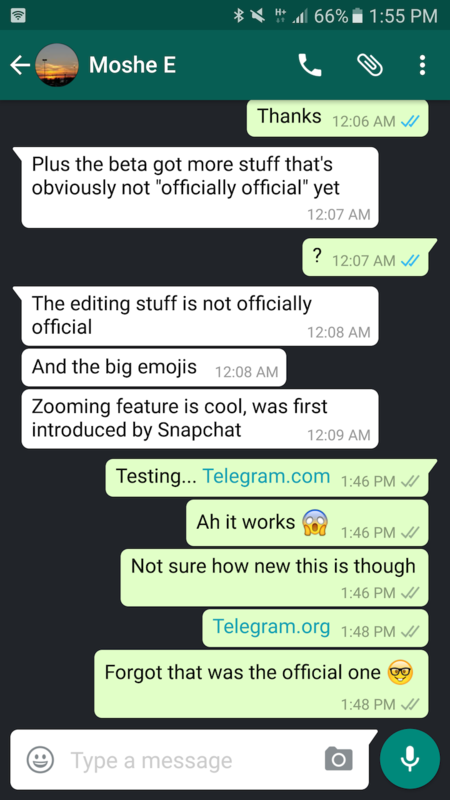 We've known WhatsApp was going to add image drawing and stickers for a while now (you could even turn on the option by installing a third-party app if your phone was rooted). But it was enabled for all without any hacks in 2.16.262. After you take a photo with the WhatsApp camera (check the section above for the camera distinction), you will be able to not only crop said image like before, but also add a sticker to it, type text, and even annotate and draw on top of it. 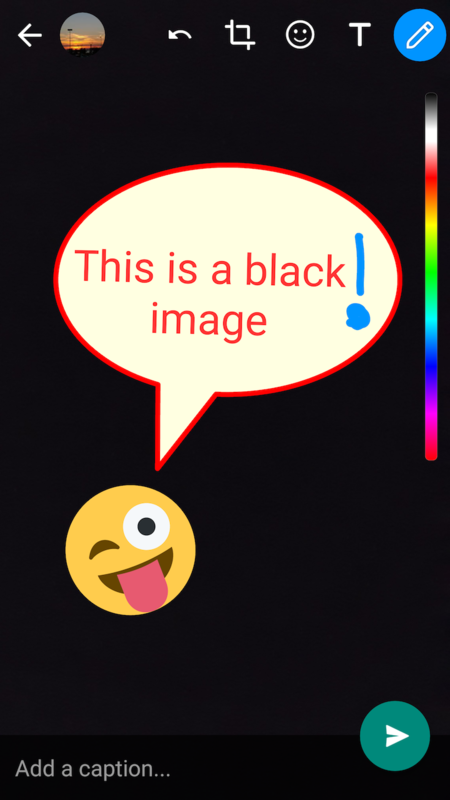 Stickers are all the rage now and WhatsApp isn't reinventing the wheel here, but it's all well done, with lots of stickers and text that you can resize, move, and rotate, and a full RGB spectrum of colors for text and drawings. There's an Undo option too, should you want to go back one or several steps. 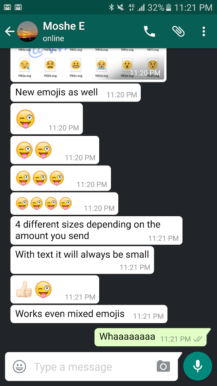 WhatsApp has added one small bonus that all you emoji lovers will sure appreciate — I know I dig it. Remember how sending a red heart results in a big emoji that's significantly larger than the others? This is basically the same idea, but just not as large as the red heart. Single emojis in messages used to appear the same way as all emojis (see the laughing face with tears in the left screenshot below). But in 2.16.256, bigger emojis were implemented so that these single ones would appear a little larger (see the same emoji in the middle screenshot). Cool, eh? Even better, there are now a few different sizes, which appear with one emoji (large), two emojis (medium), three emojis (small), and then 4 and above (regular size, same as emojis within text messages). 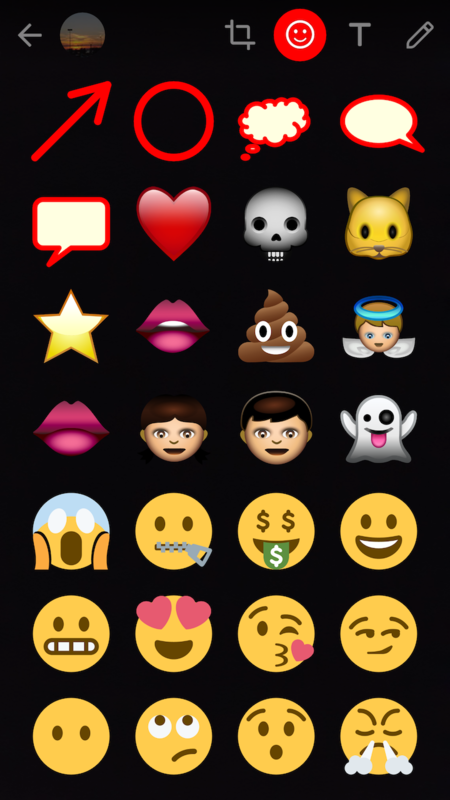 Obviously, this works whether you're sending the same emoji or a combination of different ones. 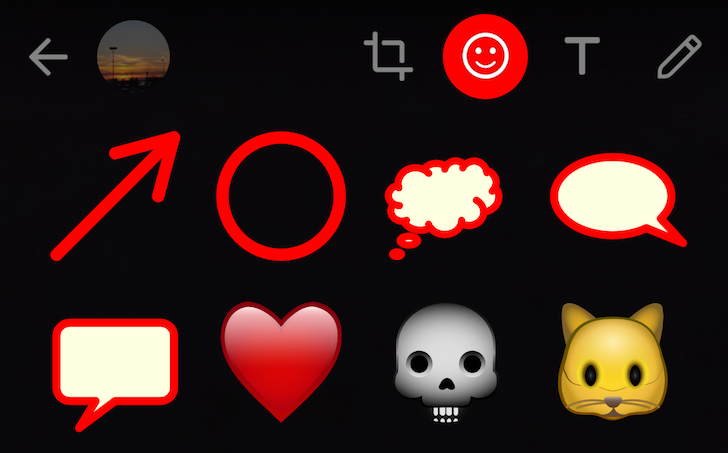 And for those of you lovers, the single red heart is now even bigger than the bigger emojis, you could say it's biggerer or the biggerest. Do you remember that big story last year about WhatsApp blocking Telegram links? 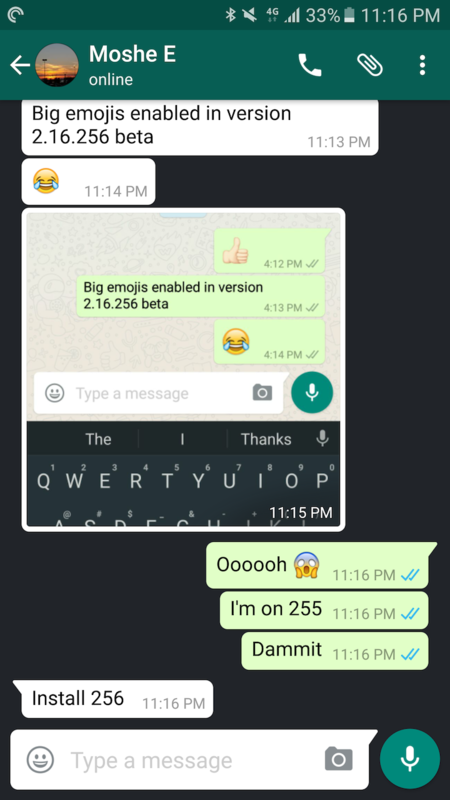 Well, I'm not exactly sure when, but WhatsApp has started allowing Telegram links back again inside messages. Maybe these were allowed back months ago, maybe it's only recently. 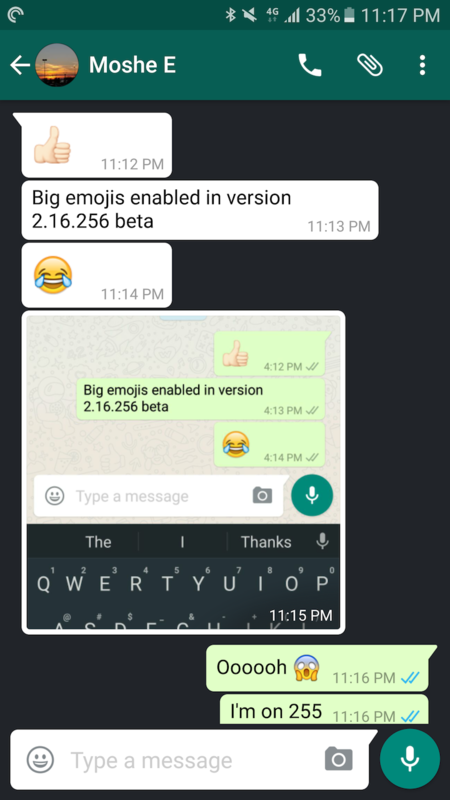 In version 2.16.269 beta of WhatsApp, the ability to draw and add stickers has been added to videos as well. 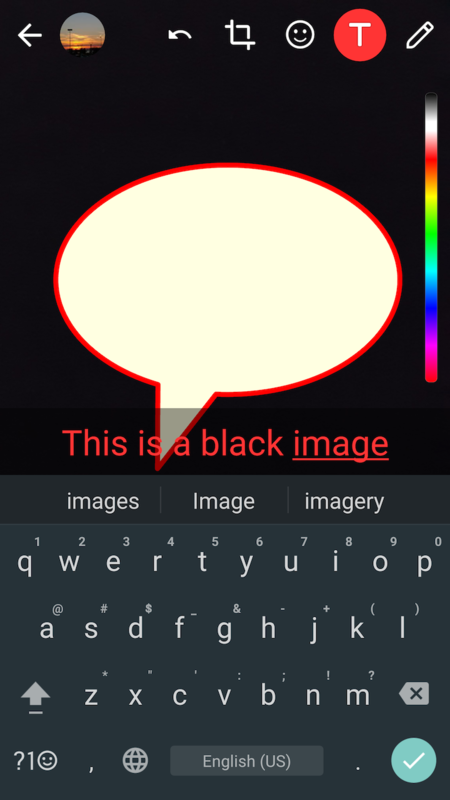 Record a video with WhatsApp's built-in camera (again, this is the one you get from the camera icon in the text box at the bottom of each chat) by holding the capture the button. Then when you're done, WhatsApp will serve the same interface to draw and insert text and stickers on top of the video as it does with images. Anything you add is static though, so keep that in mind if your hand moved a lot while recording.